Leaving Canberra at 7am and heading out via Hoskinstown to the South Black Range summit, I was ready by 8:30 am to make contact with a group of SOTA enthusiasts back in Canberra. The plan was to first use 146.5 fm to make local contacts with whoever was there. Then go to 1296 MHz ssb to make a few contacts there, and then go to the HF bands. 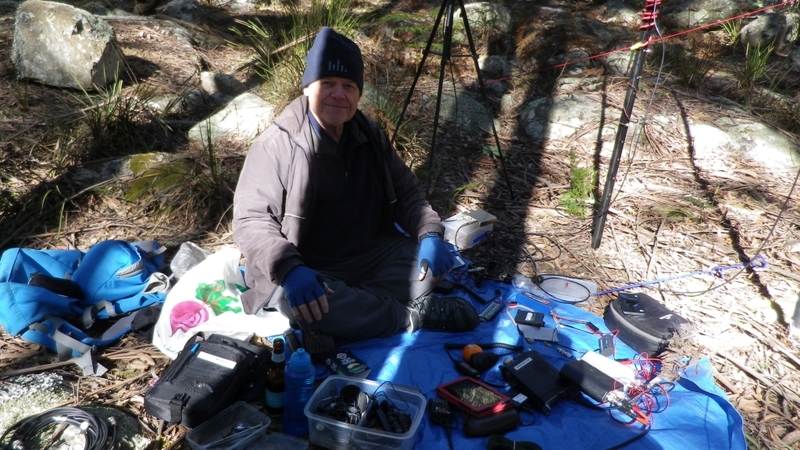 Right on time, Andrew Vk1AD spotted himself on sotawatch.org showing he was set up and ready for the morning’s contacts with a group of SOTA trainees at Mt Stromlo. Also Matt VK1MA, Al VK1RX and Ian VK1DI were on other summits. These four operators were on air on the first day of SOTA in VK1, 1st Feb 2013 and we were all on air when each of us have qualified for the 1000 point Mountain Goat award. We made our contacts and after the 4th contact, several goat bleats were heard on my radio. The unique shape of the VK2/ST-006 hilltop. 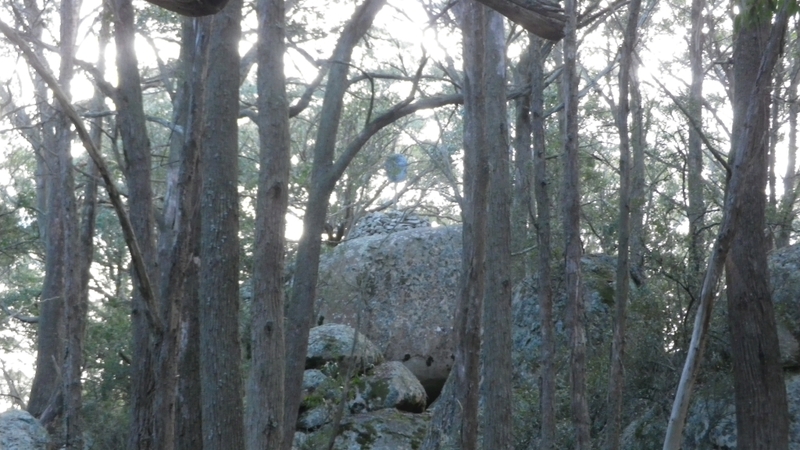 The cairn and trig are on top of a huge rock. I then moved to 1296 and made contacts with Andrew VK1AD and Bill VK1MCW. The contact with Bill was made on CW as a first for 1296 SOTA in vk1. After that it was 80m and 40m. 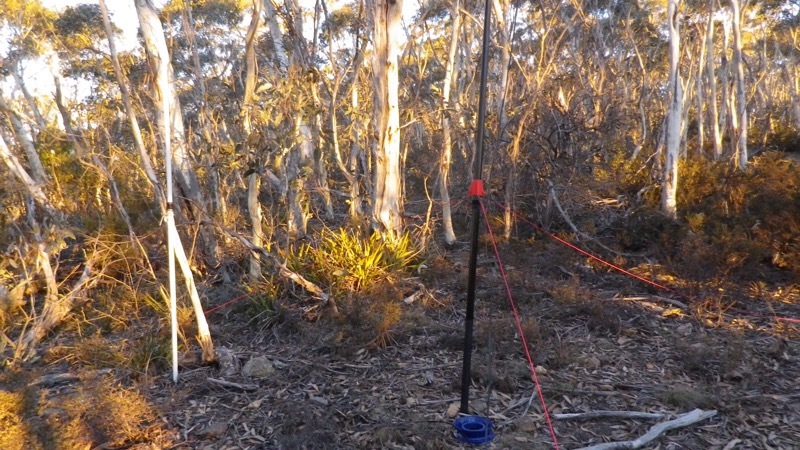 Conditions were favouring longer distances on 40m and it was necessary to use 80m to make contacts into Sydney or into the Melbourne area or any points closer in. After spending several hours on the summit and getting colder all the time, it being only just above freezing point, I was suddenly surprised by hearing a voice. There was Matt VK1MA walking towards me grinning and offering me a Mountain Goat ale. We are lucky in Australia to have a boutique brewery that has produced this very aptly named ale. 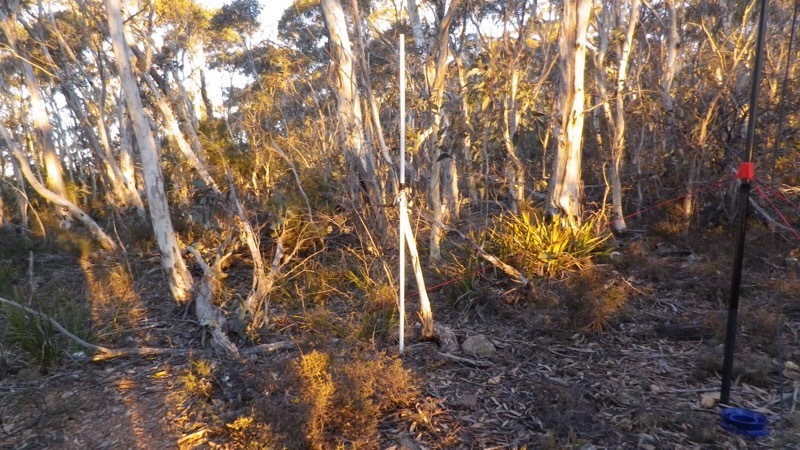 After completing the activation and packing away, Matt helped me carry all the equipment back to the car down the hill a bit, then I headed off to Mt Cowangerong to make it a double activation for the day. the operating position at South Black Range. tripod for 1296 antenna at rear. 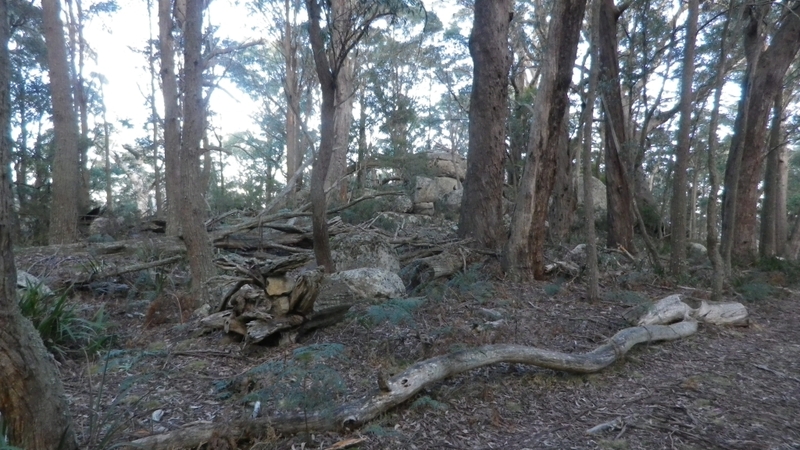 Setup at Mt Cowangerong. 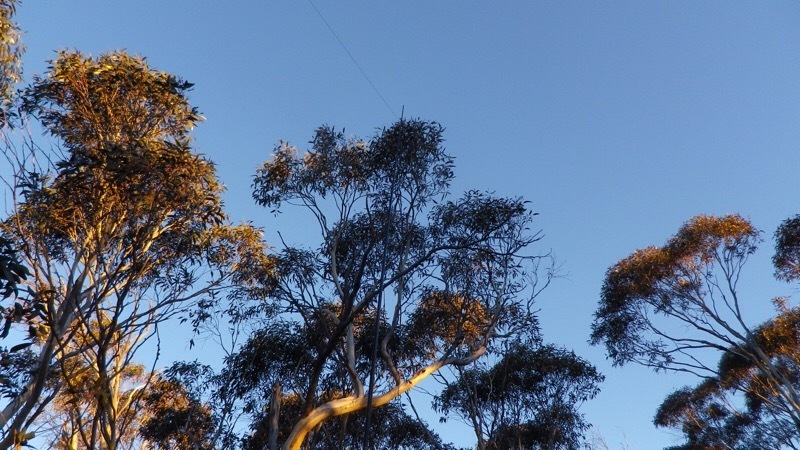 2m halfwave on the left attached to a tree, the guyed pole on the right supporting the HF wire antenna. My activator score after the Gippstech trip was 984 so I was then able to plan two activations of 8 point summits to reach and exceed 1000 points, the requirement for the Mountain Goat award under the SOTA programme. Thursday 19th July brought reasonable weather and Friday was forecast with rain and snow down to 900m. The summit I had in mind was Yankee Ned, Vk2/SW-026 at just over 1200m, but I did not plan to sit in falling snow, sleet or rain while doing it. So Thursday it was and I set out from Yass in the morning, arriving at Wee Jasper about 50 mins later, then reaching the summit parking spot at 90 or 100 minutes. Remarkably there was logging traffic on the Wee Jasper forest road and the dry weather allowed the truck to stir up a huge dust cloud, making it necessary to drop back and allow the dust to settle. At Yankee Ned it was a 20 min walk up to the summit itself, where I set up my ZS6BKW doublet, the LDG tuner and the FT817. I also had brought an amplifier and planned to try it if conditions made contacts with the 5w power level too difficult. As it happened, after making only one contact on 80m CW and making no SSB contacts after calling for 10 minutes, I decided to connect the amplifier into the antenna circuit between the radio and the ATU. It made quite a difference, and I was able to make a string of contacts in short time. One contact was with Tony VK3CAT who was mobile in Melbourne and offered to stop shortly and give me a CW contact. That was the first of several CW contacts and I was very pleased to qualify the summit on CW as well as SSB. By then it was 15:30 and the sun was getting noticeably lower in the sky, the pine trees around the summit were sufficiently tall and thick to cast quite a cold shadow over me and my equipment. So after making all the contacts that seemed possible I packed everything up and descended to the car with 995 points on the virtual scoreboard. All was ready for the coming Sunday and the activation that would seal the deal for the MG award.